Here's a nice new offering from your favorite modern-classical composer at Temporary Residence records. I immediately recognized the first song on this EP as one of his openers when I saw him play with Mono and Pelican earlier this year. All the kids there to see Pelican didn't know what was happening - some guy was playing piano really loud, and then there's all this noise coming from his guitar, and what's that thing he's holding against the strings?! That's an e-bow, kids. You should get one. But anyway, this little album seems like a set of B-sides from Talk Amongst the Trees, though they're almost certainly new. They would fit in fine on that album, though - floating, swelling keyboards and distant guitars wrapped in reverb - it's that kind of record. 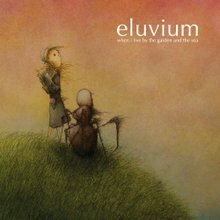 If you're not familiar with Eluvium, this is a good a place as any to start, really... though you might just go chronologically if you need a system. Start with Lambent Material and don't freak out when An Accidental Memory In Case Of Death is only piano. Stick with it, listen through "Taken" all the way on the next album, and before getting this one check out his contribution to the Travels in Constants series as well. It's a solid discography and you'd be doing yourself a favor listening to all of it. I'm giving you two tracks: the one I knew and the next one, a more shimmery affair with a clip from "The Burbs" at the beginning. What the hell? Here's "I Will Not Forget That I Have Forgotten" and "As I Drift Off," by Eluvium. All the kids there to see Pelican didn't know what was happening - some guy was playing piano really loud, and then there's all this noise coming from his guitar, and what's that thing he's holding against the strings.